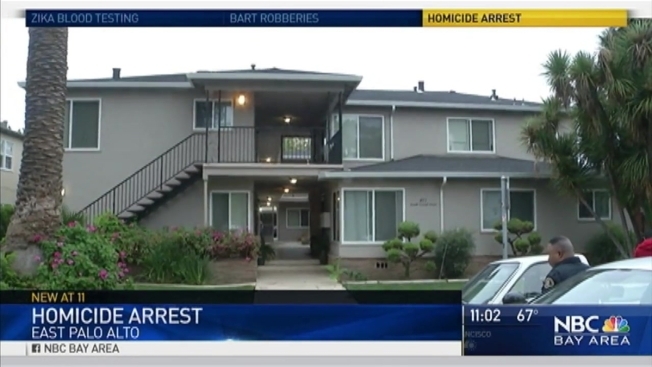 An East Palo Alto homicide suspect was arrested Friday morning in San Jose, stemming from a June 10 death of a 30-year-old man. East Palo Alto Police Chief Albert Pardina arrested 23-year-old Lionel McCoy, who is on parole for robbery, in connection with the homicide of Christopher Puckett. The two men had an ongoing "personal dispute," Pardina said, adding that they had been looking for McCoy in Oakland, where he was supposed to have been living while on parole. McCoy was arrested about 5 a.m. in the 400 block of Second Street in San Jose. Puckett was shot about 10 p.m. on June 10 in the 2400 block of Illinois Street in East Palo Alto. One of Puckett's cousins told NBC Bay Area that her cousin had two daughters and had been trying to get his life together. A man with McCoy at the San Jose apartment was also arrested, Pardina said, because he was not supposed to be associating with McCoy. His parole was revoked, Pardina said. Video at the scene showed a woman with long pink fingernails in the back of a police car at an apartment building. It's unclear what her relationship is to the homicide investigation. But she was not arrested, Pardina said.